Do I see IBM discontinuing RPG3? No, I am sure that it will still be possible to write programs in RPG3. I see this as a strong hint from IBM that it is time to move to more modern RPG. Should this be a surprise? Not to anyone who is serious about the IBM i operating system. This year is the 23rd year since RPGLE, RPG4, was launched. No enhancements have been made to the RPG3 language since then. Part of the problem of the perception of the "AS400" is that it is "out dated" with "obsolete programming languages", RPG3. That cannot be further from the truth with all the enhancements that have been made in the past 23 years, including all the changes that have been made to RPG. If you do not know the latest RPG, or choose to only use RPG3, then you risk making yourself obsolete as the rest of the IBM i world advances leaving you further behind. If you want to start learning modern RPG then read the first of the above linked posts, and keep reading this website. Good! Time to move to more modern code. 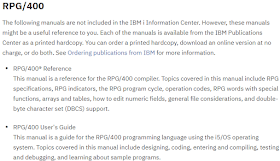 Yes the online RPG400 manual is at that link, here, but it is interesting that it is in the RDi section and not with the other RPGs. 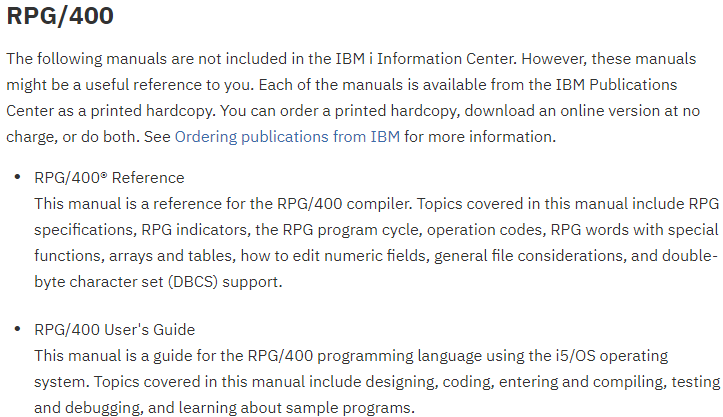 As a next step, perhaps IBM could adjust all RPG code examples to consist of only RPG free code? If they were to post modern examples it would reduce the need to a site like this. Someone on Twitter posted this link to the RPG400 manual. The site look familiar... isn't that the site for V4 manuals? I guess RPG400 has not changed since V4.